Where I share some tidbits of the organization and help other AGA chapters with starting their own club. Explain that "if a stone is surrounded along the lines, it is captured. Diagonals don't count." Take the 9x9 board, and show them a single white stone in atari in the middle. Ask "where would you place a stone to capture". It's better to give them a stone as you're saying this so they actually place the stone. Then show them a single white stone in atari on the side. Same question. Then a single white stone in the corner. Same question. Then two stones in the middle, then on the side, then in the corner. Same question each time. Then I set up a single white stone in atari in the middle and ask "if you were white, where would you place a stone to prevent being captured?" It takes 3-5 games for most people to start to get it, it goes pretty fast. If I play them, I use 5 stone handicap. Each game I *maybe* show them one thing (solid connection, diagonal/bamboo connections), but try more often to stay quiet. It's very easy to overwhelm. My first move is usually on side star point (3-7). And their first play is often attached on the "line of defeat" (2-7). I don't explain what's about to happen, but after I capture, I walk them through slowly and suggest to start again. By game 10 they are beating me. When that happens one or two times, we dispense with capture go and play regular go "the winner is the one who has the most territory, surrounds the most empty spaces" and play to "the end, when neither of us can gain any more points". Of course, they don't know what that means exactly so I tell them when that happens (usually they ask, or they sit there stumped on where to move, or they move in a place where they lose a point). Then I show them scoring and explain territory. I don't explain those very deeply, just show them how to move the stones and count the spaces. I use the flyers from AGA. Here's my customization. I also put them in a stand-up acrylic display stand anywhere I'm playing so if people are interested, they can read about the game. I often ask "Have you heard of the game of Go?". In any advertisements I refer to it as "The Ancient Game of Go". I have the AGA trifold of Capture Go with my website written on it. I have business cards to pass out to anyone that looks interested. 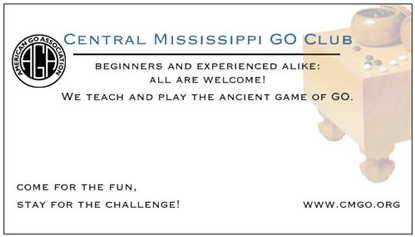 It has the website information and a plea to come learn or play and the AGA rules on the back. I put an email link on the website, not on the business card. Carry business cards with you everywhere (5-10 is usually enough). If someone is interested, they'll walk away usually with a business card, the tri-fold Capture Go, and the 9x9 board with Capture Go instructions on the back. I would start with one 19x19, two 13x13 boards, and four 9x9. This requires 3 full sets of stones and will handle 14 people all playing at the same time. You can have a dozen printed 9x9 boards to hand out or use as well. This will handle 4 more people if no one uses the 13x13. It all depends on your mix of skill levels. I end up teaching a lot of people at our club, so I use more of the small boards. The AGF has one of the best deals on most teaching/club equipment for qualified programs, though I think there's not enough bowls if you split the stones up for use with small boards. You can supplement the bowls with Ziploc Smart Snap bowls from Walmart. Size "XS" bowl is great for this (6 for about $3). Another option is the Go Kit Club Pack which is similar in cost with different equipment (laminated boards, plastic chips for stones, bowls for everyone). I don't know of any other inexpensive equipment options for clubs. This is an empty field and we are both running fence to see who can get the most. The stones are the fenceposts and you fill in the fence when you get pushed. To keep it interesting (and not turn into "My side, your side") you can pull out the posts if you surround them yourself. Kinda rural-based, but seems to get the idea across to most people quickly. Feel free to use at your leisure. Any talk of "eyes" or "living groups" comes later. Do-it-yourself giant vinyl go board. I'm making a 9x9 go "board" for 2-inch painted wood "stones". Using the material from the DIY Internet Resources, I obtained two yards of felt-backed vinyl in ivory, a black Sharpie "Fine", a yard stick, pencil, and scissors. Placing the stones end to end, I made sure the size would be acceptable. The stones are advertised at 2" but are just slightly smaller. So a two inch grid is perfect. Cutting out the vinyl at 23 inches leaves plenty of room if I wanted to finish the edges. The end lines will be 17 inches apart. I didn't include and perspective compensation as many wood boards do, so my board is exactly square. I drew small pencil lines for the corners so the grid would be approximately center. Measure both diagonals to make sure they are equal. If they are, the grid will be square. Then align the yardstick along each side and mark off every two inches. Once you have the grid ends marked in pencil, you can draw each grid line with the Sharpie. That's all I did for my first "giant vinyl board". The next one will be 13x13 for 2" stones. That'd be a total width of about 26 inches. As I mentioned in the last DIY article: I am not crafty. If I can do this, you can too! Need beginner boards for your club? If you want beginner boards for your club, I've put up a store page where you can get a Go Kit Club Pack: a set of 9x9 and/or 13x13 boards laminated on cardstock shipped and ready to go. Convenient and inexpensive. I had two goals for this project, make some large-size nontoxic go stones (2 inches), and make some demonstration stones (1.5 inches with magnet). The biggest thing to note: I am not a crafter or DIY person at all. If I can do this, it probably means you can, too. After a lot of research, I found 1.5-inch wooden domed discs for 13.2¢ in quantities of 100. Two-inch discs are 23.6¢ each in quantity 100. As an experiment, I went with the bigger 3/4-inch magnet. I also researched non-toxic paint and finally went to local crafts store and purchased two candidates. On the left is Richart Washable Paint. On the right is Apple Barrel Acrylic Paint. Both are Certified ACMI-AP. The Richart is much less expensive--the bigger bottle was $2 while the small bottle of Apple Barrel Acrylic Paint was $1. As you can see, the Apple Barrel covered much better in one coat than the Richart in two coats. I then set about painting the rest. The technique I settled on that seemed to work best is to paint the edges individually. Put paint on one side of the brush, then use the other side of the brush to paint the edge from top to bottom as shown (see the video below in "attachments"). Once the edges are complete for about 40 of them and set down all in a row on newspaper, then I painted the tops. One coat of black seems to be enough! On to the white. One the white I was able to use a consistent technique learned from the black batch. The first coat went much quicker. You can see both the 2-inch large stones and the 1.5-inch demonstration stones here. There were lots of lines and streaks on the white stones, so they needed another coat. I applied the paint in three major batches to give the paint in one batch a little time to dry before applying the second coat. Dry time between coats was maybe 15 minutes (but working continuously on the next batch). There was just enough paint in the small bottle to paint 100 2-inch and 50 1.5-inch stones with two coats. As you'll see the picture below, the backs are unpainted. Overall 1-2 hours to dry semi-completely, there were still small beads of paint that were wet. When picking up, some of the stones were painted to the newspaper. I just figure that it adds character. Once dry, I needed to add magnets to the demonstration stones. After again researching supplies and seeing many references to E-6000 adhesive, I decided to try it. It apparently bonds to many different materials and the bonds is somewhat shock-absorbing (unlike Super Glue aka cyanoacrylate). Here's a somewhat "marketing oriented" video of its properties. The video was nice because it allowed me to see the viscosity of the adhesive before trying to use it (was it going to run? or glop on top? Answer: it glops and generally stays put). I finally figured out to use a plastic knife to scoop a very small raisin-sized drop applied to the wood. Applied to about 20 at a time, then pressed the magnets, then glue for the next batch. Work in a direction where your arm/clothing doesn't drape over the glue drops and be especially careful about the new magnet snapping to the already placed magnets. The E-6000 dries in 24-72 hours. So be prepared to let them sit for that long without being disturbed. They ended up great! And if you don't have the requirement of non-toxic, I'm sure it will be simpler with spray paint. I'm going to teach my 4-year-old nephew go using the 2-inch stones. I used non-toxic paint because there's a baby in the house and the less dangerous these are to all inhabitants, the more likely they'll be out for playing. A few more refinements: My brief time with them appears the white/black may mark each other when rubbed together. I may want to figure out how to safely finish these with varnish, polyurethane, or spray shellac. I'll investigate and report later. Now, who makes a board suitable for 2-inch go stones? Answer: I do, in part 2. Stay tuned. To prepare for the first meeting, I feel like I need to be prepared to both play the game and evangelize for Go. I am prepared for both. Here is my "Go Box" that I intend for storing the materials and taking to meetings to make it feel as professional and organized as I can. Broken up into 4 sets each (8 total) for 9x9 play. Separated into Ziplock snack bags. "Bowls" consist of the Ziplock SmartSnap "XS Bowl" 8oz. This holds (smallish) single-color stones for 13x13. And easily holds the 9x9 set. 19x19 "bowls" are the ziplock SmartSnap "S Square" 20oz. Side 1: Customized "We Play Go" flyer. Copies of "Way To Go"